Hope you had a good time at the August event. The September Tango Milonga will be coming up very soon! We will once again have it at the Swanky Summer House Café, Aurobindo Market, Hauz Khas. The date and time – Monday, September 14th , 8:00 PM — 12:00 AM. Hope to see you there. Special F&B specials for the Tango community. 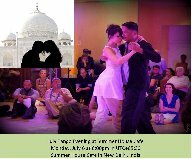 After a summer break in June, The July Tango Milonga will be coming up very soon! We will once again have it at the Swanky Summer House Café, Aurobindo Market, Hauz Khas. The date and time – Monday, Monday July 6th, 8:00 PM — 12:00 AM. Hope to see you there. Be there, it is will be great! Hopefully it will not get too hot yet. if it does, Batik shirts are still recommended!